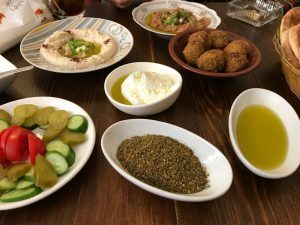 Day 28 – 30 in Palestine – YALLAH! You All Are Hackers. Here in Palestine, I have constantly the feeling that we’re running out of time. The first half of this day, was exactly like that. I joined a meeting of the al-Am’ari team. The idea was to plan the upcoming and last week, reflecting about their previous achievements and whatever else needed to be discussed. It was a bit messy, due to the fact that they have to count in so many different factors (their own schedules and the ones of their volunteers, school days and days off, Renad leaving on Sunday and some broken hardware). Instead of going out for lunch, we decided to order pizza from Angelo’s an “Italian” place nearby in order to save time and continue discussing. After around one hour, the pizza arrived (one with eggplant and bell pepper, one with Salami that didn’t have Salami on it but to some extent tasted like Salami) and we had to eat fast, since us German girls had an appointment at 3 o’clock at the Turkish Bath. Renad took us to the bus station, blocking the door so we wouldn’t be run over by some locals and told the driver to drop us off right in front of the place. 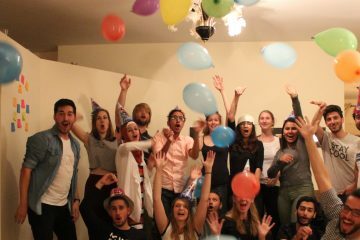 I guess, we were all super excited. Some of us have been to a sauna or a thermal spa – but not the Turkish version and definitely not in a context like this. As promised, we were dropped off right in front of it. There are two separate entrances – one for Gentlemen and one for Ladies. After taking a proof photo (the guys have been a bit bitchy that they couldn’t come with us), we went inside. I was the last one entering, but after the first one opened the door, I heard the typical Arab cheering/yelling/jeering, called Zaghrati. We probably looked super confused, because we were told immediately told that a German Bride to be was here with some friends. The manager of the Turkish Bath, Rana, welcomed us and asked us to wait inside, she would be with us in a few minutes. The entrance is equipped with traditional sofas and some coffee tables, the next room we were asked to wait in as well. Two women came and started explaining to us and some other foreigners (most likely European women) but then the manager appeared and took over. We were already prepared and wearing our bikinis, so we just had to put our clothes, shoes and bags in the lockers. In the meantime, Rana explained what different packages they offer from which we can choose. Poor Rana, we didn’t get all the different options so she would explain later again. I already noticed to many different choices of clothing in here; us, with our bikinis, employees in hot pants, tank tops or rather covered with longer shirts and tights up to “full body coverage” like sweatpants or pyjamas. The first stop was the steam room, a small (maybe 2×2,5m) tiled room with two steps you can sit on. One could literally see 20 cm far, after that I was so steamy and blurry. We all gathered on the lower step and tried to adjust. I’ve been in a thermal spa several times, but I usually skip steam rooms – I prefer hot saunas with a lower humidity. Rana entered, carrying a serving tray with cups filled with red juice. Renad told us earlier, that we would get this juice every 20 minutes to make sure, we won’t dehydrate. I guess it was Sarah who found out that it was hibiscus juice. Rana told us, we have to stay in this room between 10 and 15 minutes to get our bodies ready for the treatments. It’s hard to keep track of time and counting seconds, while trying to focus on your own breath and feeling sweat and water running down your arms, legs and your face. When I felt I couldn’t stand it anymore, I took five more deep breaths to “force” my body not do panic and then left the room. Outside, one of Rana’s colleagues were waiting for us and asked us to take a shower and then take a quick swim in a cold pool. Apparently, we stayed around 13 minutes in the steam room, so we didn’t have to get back in there – but we did. Rana explained again all the different packages and we all chose the biggest one, including the basic Hamam package (steam, shower, swim, hot stone as much as we want) plus a full body scrub, a full body olive soap wash, a full body massage and a face mask – all for 150 NIS (or 35,72 Euro). After a couple of those rounds (steam, shower, cold pool) we went to the “hot stone room”. One big and two smaller “hot stages”, made out of marble, granite or any other stone-ish compound filled the room. We got sheets and were asked to lay down on them. At first, I had problems finding a comfortable position but after a while, I just enjoyed the heat and the sound of dripping water. One by one, we went to the backside of the hot stone room. In this half-separated room, we got the scrub and the soap wash. Some of us, depending on our clothes, were asked to take off our tops. For me, it wasn’t weird at all – I am used to saunas where you are not allowed to wear anything but I couldn’t help but wonder if it’s not weird for the locals. After this treatment, we split up and did what we wanted to do; I stayed in the hot stone room. Around 15 minutes later, another woman of the Hamam team came to us and asked for two people for the massage. Since Sarah and I were free, we followed her into a room with two massage benches. I tried not to look at Sarah’s face, since I knew what she was thinking. Are we about to get some kind of couple’s massage? We tried hard to stay serious while laying down on those benches. Rana showed up and put the mask on our faces. 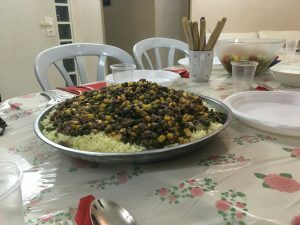 We could identify the smell and together, with a mix of Arabic, English and just describing we figured it out – a mix of pomegranate and some kind of seaweed. I took the opportunity to ask what I has crossed my mind literally every ten minutes. “Well, you are running this place for around 18 years now. We have found the best ways to recycle the water.” That wasn’t actually a satisfying question but from the way she said it, I could sense that I wasn’t easy all the time. So, I just let it go. After we were having our massages, we went back to the hot stone room – super relaxed and oily. I finally had the feeling of slowing down and being grounded again. One could think, that in this “Inshallah I’ll be there; it doesn’t matter if you are 10 or 30 minutes late” mentality, life is slowing down easily and naturally. But for me personally, that’s what’s keeping me hectic and always uncertain about my plans all day and I have to face this issue every time I come here. I must’ve fallen asleep on the hot stone, when I opened my eyes, Sarah was gone and Jenny was chilling next to me. I had no idea what time it was, but I started getting hungry and tired – a sign to call it a day. We all took a final shower, got dressed and gathered our belongings. The employees have already started cleaning up and some got dressed next to us. I noticed two of them, who were running around in shirts and leggings now putting on their Hijab. Rana came to us, one last time and asked us if we enjoyed our time. We couldn’t express how much of a great experience it was and that we all love to come back. We started the tour and went to the rooftop of the Austrian Hospice from which we had a great view over the old city of Jerusalem. We then realized, it was already 10:15 and we were only allowed to enter al-aqsa until 11. We hurried up and reached some kind of security gate. A security guy asked us for our passports (I noticed that he didn’t ask anybody around us). We had some German Passports, Mo’ath is having the Jerusalem ID and Razan had her green ID and her permission with her. 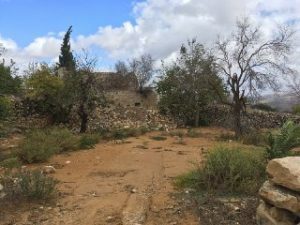 The guy couldn’t speak English properly, so we didn’t understand the problem – what we understood was that Razan was not allowed to enter from here. Within three minutes, he turned pretty pissed and asked us: “Do you want to talk to a policeman? I can call one if you want me to!” It seemed a bit like a threat, but we gladly accepted his offer and waited at the corner. Around five minutes later, some guy in a police uniform showed up, around 5.4 feet tall, trying to take as much space as possible. He couldn’t look more bored while talking to Mo’ath about the issue. 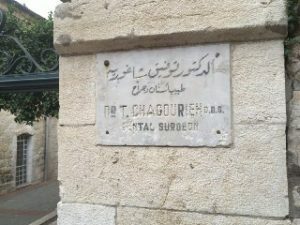 Eventually, he and Razan had to take another entrance and we would meet them somewhere inside. I still don’t know what that was all about. 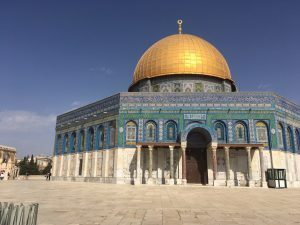 It was super crowded on the square that leads to the Wailing wall and the wooden bridge, that tourists take to enter the square in front of al-aqsa and the dome of the rock. Funny coincidence, we saw Julian walking on the bridge and yelled his name. Even funnier, he heard us and waved us to follow him. We literally ran to the entrance, convinced the guy to let us through (we would only be there for like 10 minutes), passed another security check and finally entered the square where Mo’ath and Razan were waiting together with Aydin and Samer. Julian was wandering somewhere, being on VR footage duty. 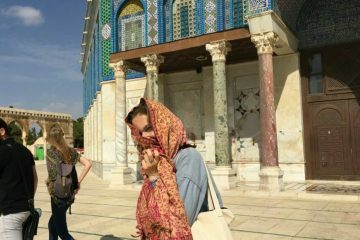 After walking around on a while and convincing Jenny that it doesn’t matter that she is wearing her scarf as a Hijab, she couldn’t enter the dome of the rock, some Palestinian security men came to us and asked us to leave – it was prayer time. 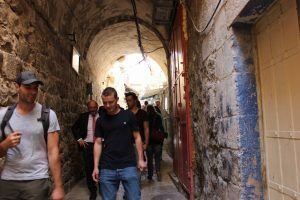 So, we continued strolling through the old city and all the Germans in the group went silent, as we walked by Martin Schulz, a German politician and his delegation(?). (Cheers to you Aydin, for not standing there speechless and for taking the photo). We continued our way, made a quick stop at the Church of the Holy Sepulchre and spend some time souvenir shopping. Samer then insisted on us seeing the fancy mall right behind the Tower of David Museum. Honestly, it was so weird. Have you ever been to one of those outlet cities in the Netherlands where you buy brands for little money and which seem so fake and “too soft” designed and gives you a feeling of “something must be wrong”? It felt exactly like that. Samer guided us to the Waldorf Astoria Hotel (since we already visited the Walled Off Hotel in Bethlehem and there are similarities not only in Phonetics). We then walked through the newer part of the City to the Russian Compound, the Court, the Prison and the Museum of the Underground Prisoners. On the way back to Damascus gate for a little Lunch break, the weather completely changed. It started to rain and the wind became stronger. Some of us (including me) really enjoyed it – it has been too long that I felt rain on my skin. 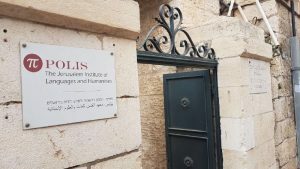 The last stop before lunch was a house, that used to serve as a dental practice (back in the day) and is now used as the “POLIS Jerusalem Institute of Language and Humanities”. How do we know? There are still both signs next to the door. We ordered Shawarma Sandwiches for the group close to Damascus gate and sat down outside. It was not as comfortable as it could have been, due to the wind that was moving the plastic tarpaulin and the chairs back and forth. 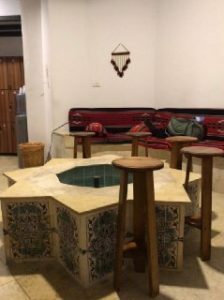 We spend the afternoon mainly in the Old City and wanted to spend the rest in the Garden tombs but it was getting cold and there were too many people so we decided to spend the remaining time in a coffee shop until we could go to Nizar’s place for dinner. While sitting in the warm and trying not to fall asleep, Renad and her little sisters showed up – what definitely lightened the mood again. They all were so exhausted but in a happy way. Rita was obsessed with the map from the zoo and showed Razan all the animals she saw that day. Renad and Razan decided to leave early since the little girls were too tired and we wouldn’t leave Jerusalem until 10 pm. Around 6, we walked to a bus station to go to Nizar’s place. This part of Jerusalem (or is it a suburb, I really don’t know) already had some Christmas decorations. Again, I realized, I would miss the best part of fall in Germany. Nizar was already waiting for us outside, looking a bit like a kid at Christmas eve, waiting for Santa Clause to arrive. He waved us inside and we almost bumped into a big table that was set up in the living room. His mum, his dad, his sister and his little brother were right behind him and welcomed us in the loveliest way. 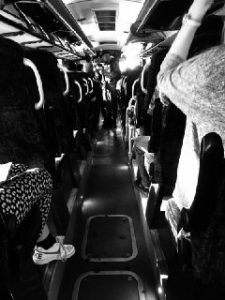 Before we even took off our jackets, they were bringing lots of food in the room – chicken and rice, salads and yoghurt. Right from the beginning, it was a very open, fun and relaxed atmosphere. 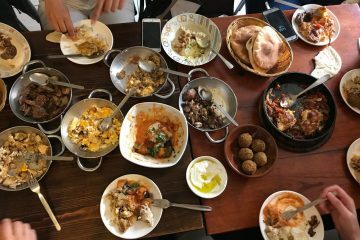 We ate a lot, we talked about the exchange, discussed politics, were listening to music and watching video and real performances of dabke. Later on, Nizar’s older brother and his wife and Nizar’s older sister with her little son joined us as well. It was a great ending to a very long day. He therefore just listed what they have and Abu Majid orders the basics – falafel, foul, zeit ou zaatar, labna and tea. I noticed two men the next table who were drinking some Raki with their breakfast – and also offered us some. We had a little chat about Halloween is celebrated here – their kids were dressed up as a Princess and as Batman. After we ate too much, we took a little walk again and ended up in front of the mosque, right at the last five minutes of the Friday Prayer. We were picked up by a Ford that, by honking, tried to attract other passengers. Back in Ramallah, the streets were even more crowded because the Prayer was officially over. Back in the apartment, Baba and Baba took a nap and I joined Sarah, Aydin, Jenny K and Jenny Z for their lunch at the vintage café. It seemed pretty international, a bit like Zamn but with better food options and more colorful pictures on the wall. Since I just had breakfast, I couldn’t eat at all and was already concerned that I wouldn’t be hungry ever again. 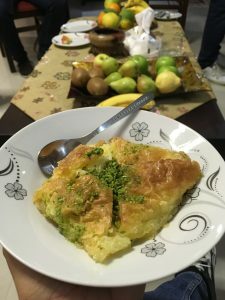 That night, we were invited to Ahmad’s house for mulukhiyah or “The Arab’s mallow”, some kind of spinach plant soup that’s eaten with rice. (Un)Lucky us, there was so much more to eat; stuffed eggplant and zucchini, stuffed chicken, tons of rice and salad. Ahmad, like a stereotypical Palestinian Mama fed us all night and didn’t even stop for dessert. Apparently, he needed to pick it up and some of us joined. Since his car was already full, Omar and I took his one and just followed him, Rawand, Julian, Sarah and Jenny Z. I first thought, Ahmad is going to the place Samer usually takes us, but the stopped on the right side around 200 m before the other place. Omar, who had caught up very fast (without disregarding traffic rules, nice job man) parked around 20 meters away. When we were walking to the group, we already noticed them breaking into laughter and asked what was going on. Apparently, Sarah didn’t notice that we already passed by their car to park and wanted to stop us. So, she jumped on the street, knocked on the bonnet and waved like crazy to the people sitting in the car. But it wasn’t us and when she realized that, she just ran back to the group and started laughing. After they finished the story, Omar and I looked at the car Sarah stopped. The people were still a bit confused but probably also realized, that it was us Sarah was actually looking for. They were also laughing and drove away. After having desert, fruit, coffee and tea, we all went back to the apartment to “celebrate” Majid’s last day with us. Spoiler alert: He wouldn’t leave the next day.